I spent all day Saturday at the AQS Quilt show in Grand Rapids, MI. It was fabulous. My friend, Sandy and I went through all the vendors together. Sandy had already been through on a previous day but still found some things she had to have. I spent my share, but I think I did very well. I added a few more project kits to add to my collection of kits that I bought last year at the AQS show! I enjoyed shopping and visiting with Sandy all morning. We made it through all the vendors in 4 1/2 hours, not bad! 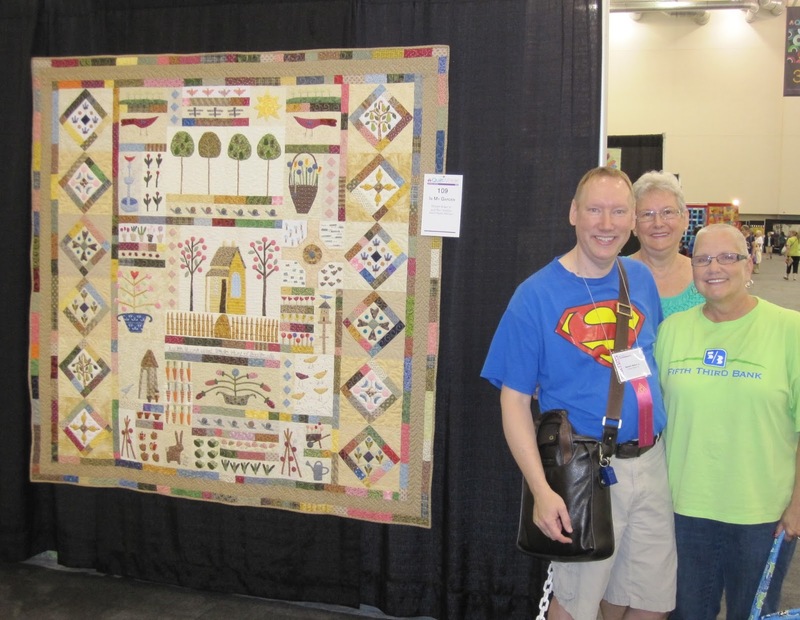 I made sure that Terri and I got a picture together with our quilt! If you haven't seen previous post about this quilt, Terri did the quilting (and a fabulous job too). We didn't win any ribbons, but just getting accepted into the show was award enough for me. Then later in the afternoon my Mom, Aunt Ann, sister-in-law Venus, niece Brianna, friend Dan, nephew Austin and Jim came to the show and we all walked around viewing the quilts. 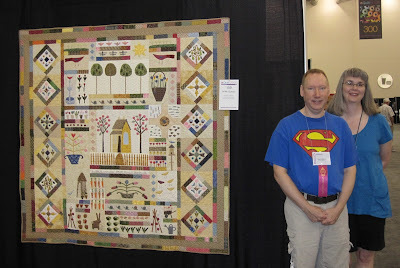 It was a wonderful day, seeing my quilt hanging in a National show (getting tons of beautiful comments on it), visiting with several quilty friends and visiting with family. I also stayed and helped with the take down of the show. This year we had a very good sized group of volunteers so it went very fast. It was a very long day but one I enjoyed very much.